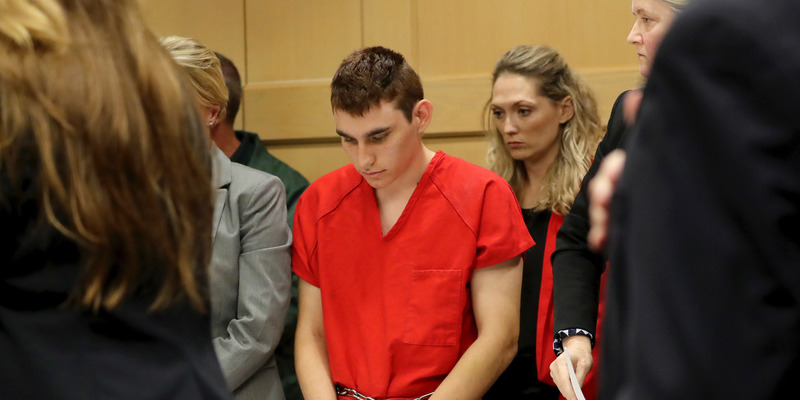 South Florida Sun-Sentinel/Mike Stocker via Associated PressNikolas Cruz appears in court for a status hearing in Fort Lauderdale, Florida on Feb. 19, 2018. Florida shooting suspect Nikolas Cruz followed an individualized education plan at the alternative school he attended before transferring to the Marjory Stoneman Douglas High School. School records obtained by ABC show that Cruz frequently discussed violent topics, such as guns, wars, and terrorists. Cruz also showed some promising improvements, volunteering at the YMCA and making plans for a future college education or military career, the records show. School records show that the suspected Florida high-school shooter displayed a long history of emotional and behavioural problems, and a fixation on guns, wars, and terrorists. Seven months before Nikolas Cruz transferred to Marjory Stoneman Douglas High School, which he allegedly opened fire on last Wednesday, Cruz attended an alternative school and followed an individualized education plan, according to the records obtained by local ABC affiliate WPLG. The IEP tracked Cruz’s progress through ninth grade at Cross Creek school, documenting a jumble of promising achievements and disturbing setbacks. Cruz was at times focused on self-improvement and eager to get his driver’s licence and plan for a future college education or military career, the records said. But Cruz was also easily distracted from his lessons, spoke often about violence, and occasionally fought with his peers outside class. Cruz’s former classmates and neighbours have also said Cruz was preoccupied with weapons, flaunting photographs of his guns and firing at targets in his backyard. Authorities said Cruz legally purchased the AR-15 semi-automatic rifle he allegedly used to gun down 17 people at the high school in Parkland, Florida. The school records also documented two behavioural incidents in which Cruz jumped out the back of a bus at the urging of a peer, and another where he allegedly used racial slurs against a peer and was then punched repeatedly. The records also said Cruz had difficulty managing his emotions and disliked accepting responsibility for problems. Cruz’s old school wasn’t the only institution that documented his behavioural problems – Florida’s social services agency previously investigated Cruz in 2016 after he posted videos on Snapchat that showed him cutting his arms and saying he wanted to buy a gun. Agency investigators questioned Cruz at his home, ultimately identifying him as a “vulnerable adult due to mental illness,” including depression, autism, and attention-deficit hyperactivity disorder, which he was medicated for. Broward Circuit Judge Charles Greene on Monday ordered that the agency release parts of Cruz’s mental-health assessment. But the school records also showed that Cruz was anxious to improve inside and outside the classroom. He disliked attending the alternative school and wanted to be “mainstreamed to his home high school,” which likely referred to Marjory Stoneman Douglas High School. “He often perseverates on the idea that his current school is for students that are ‘not smart’ and that he can now handle being in ‘regular’ school,” the records said. Cruz was also “very focused on making appropriate choices in both the school and his neighbourhood community,” and enjoyed volunteering for the YMCA every week. In his science class, Cruz was “very compliant” and “helpful to his peers,” the records said. His mother, who died last year, even said at the time that she was “happy with his academic as well as behavioural progress,” the records noted. Cruz is being held without bond on 17 counts of first-degree murder.